I care deeply about sharing with others the how and why behind learning more old fashioned, domestic pursuits like sewing, canning, and mending. Sure, I love those activities in a hobby sense, but far more importantly, those skills allow a person to become less dependent on others. I can’t tell you the number of women who have told me that they couldn’t hem their pants, had no idea how to fix a tear, or that they were afraid of canning. The idea that they feel they could not do those very simple things and had so much fear that they dare not even attempt a cooking task like canning is very troubling to me. Of course a person can do those things! Our grandmothers were no more able or bright than we are today. Yet many of us have erroneously developed this idea that we can’t, and what a shame that is. There are two problems with this whole mindset- that a perfectly capable gal can’t make jam or sew on a button- one being that it makes said gal dependent on someone else to do it for her. By learning how to take in a dress, fix a rug binding, or cook a large and vaguely frightening squash, we take control of those tasks, those objects, and the time, money, and benefit associated. Cooking is the most obvious of these examples where the control of the food we and our families consume is often in someone else’s hands. I’m not saying all those other hands are bad, necessarily, but they aren’t our own. By embracing the idea that if we learn a few new things we take a bit more authority in the design and quality of our lives. Furthermore, developing increased sovereignty is certain to grow one’s confidence in other, related areas. It feels really, truly good to be able to solve a problem-even a simple thing like pants that are too long-for yourself. The second problem is the idea that a person cannot learn these things. It is fine if you don’t like sewing or you don’t care to learn to put up salsa. It is not fine that all kinds of people are going about believing that those skills are vastly beyond their capability. I’m here to tell you that you indeed can learn these skills-any skills you want to- and that they are not “hard” but are a matter of deciding to learn. I worked in a fabric store while attending all five years of college and daily customers indicated that they felt like they could not ever sew/knit/tat/insert any craft here. That is bananas. Now, people compliment me often, gushing that they could never sew as I do, as if I’m a Navaho Code Talker. This is also bananas. I very rarely attempt projects, for fun or necessity, that are very difficult. Yes, anything new can be hard at first, but of course with a little practice and either mentorship or self education, it becomes much easier. Many who are working, ruling boardrooms, managing teams of subordinates, single-momming and killin’ it, caretaking and problem solving, believe falsely that they could not learn to sew a bag or crochet a scarf. This makes no sense at all, of course. 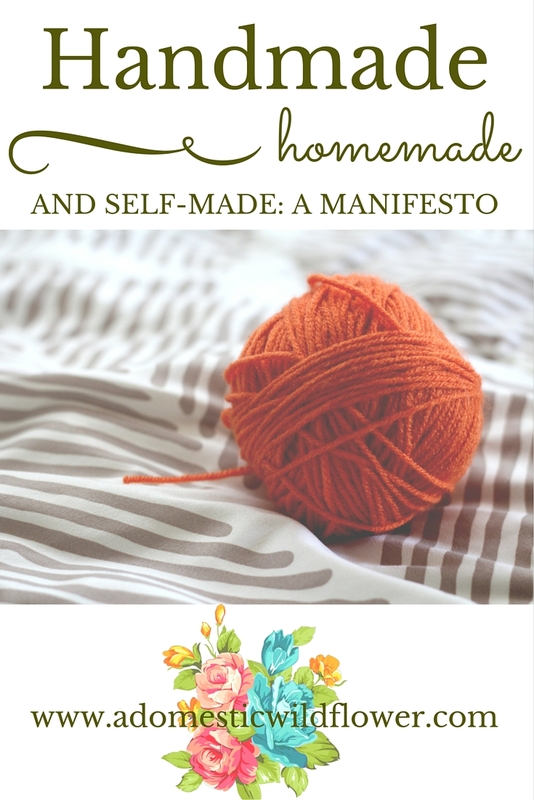 The final element of this manifesto is to encourage you to find a domestic pursuit that you enjoy and do it for the sake of the pleasure in it. The satisfaction from picking, cooking, smelling, tasting, and finally canning your own jam can be tremendous. Choosing beautiful fabric or deliciously colored yarn can be therapeutic, and sitting before a spinning wheel that you finally get spinning the right way can be downright triumphant. If crocheting a hat makes you want to put the hook in your eye, then find a different medium that gives you pleasure, takes control over one tiny part of your life, and shows yourself and the world that you can absolutely learn a challenging new skill.